Whispering Hills Nursery Blog: Local love: Where were your plants grown? Local love: Where were your plants grown? 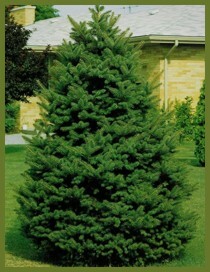 Was your Colorado Spruce actually grown in Colorado? When we Yankees in Illinois get visitors from the South, their accent quickly tells us where they came from. Plants, however, aren't blessed with (cursed with?) the ability to speak, so you'll have a harder time figuring out if that arborvitae in your yard came from down the road or Tennessee. However, if the plant took a long time to thrive, that might be an indication that it wasn't grown in northern Illinois soil. It's not just big box stores that sell non-local plant material; many area garden centers sacrifice quality when they bring in cheaper plants from areas with longer growing seasons. Not only are locally grown plants already adjusted to the soil in your yard, they also have a shorter trip from the grower to the market. That means the growers can time their shipments accurately and deliver the plants when they are just about to hit their peak bloom. Locally grown plants typically look better in your yard, but it's not all about you, you know. The growers obviously benefit, too, and when you buy their plants you help keep their fields from becoming another Wal-Mart. And we have enough Wal-Marts in our area. How can you tell if the plant you're buying is grown locally? The root ball will be much smaller than ones on their non-local kin. The soil on a locally grown plant will be dark in color and have a high clay content, whereas non-local soils will likely be a lighter, reddish color (Tennessee) or have a high sand content (Michigan). If you'd rather not worry about whether a plant you're thinking of buying was grown locally, just come to Whispering Hills. Nearly all of our plant material is locally grown, coming from such places as Harvard, Marengo, and Poplar Grove.